Allowed limit is 1 mg/ml in wine, a third of that for beer. 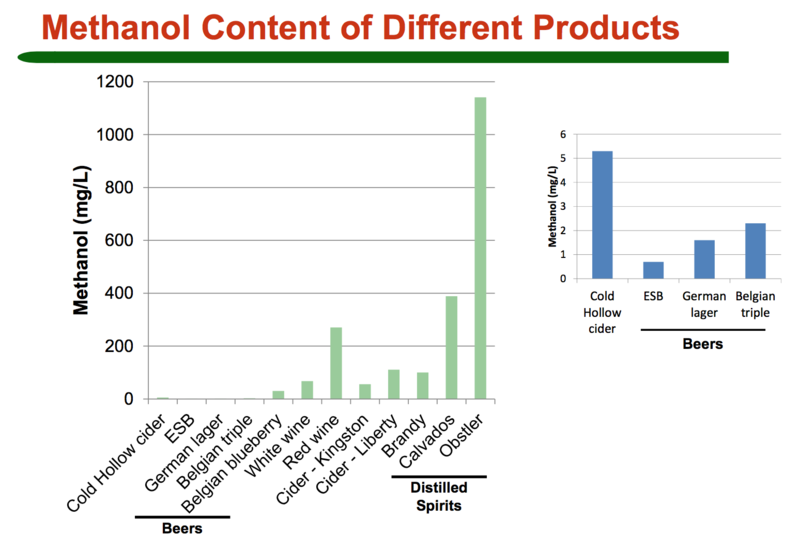 Fruit derived fermented beverages can have considerable methanol, while very low levels are typical in beer. Red wine typical value is 0.2 mg/ml, cider 0.005 mg/ml, and beer 0.0005-0.002 mg/ml. HPLC and GC-MS require bulky equipment and expense. The chromotropic acid method doesn’t distinguish ethanol from methanol. The flow method (pdf) uses 3 enzymes and a fluorometric detection. Prepared flow chamber is reported stable for 3 months. The FTIR method is described here. A 1 ul samples is vaporized and flowed in N2 across an FTIR cell. Methanol and ethanol have similar spectra, but ethanol has additional absorbance at 1250 and 900 cm-1. Absorbance in the wavenumber ranges 950–820 and 1025–950 cm-1 using as baselines 950–820 and 1150–950 cm-1 respectively was calculated, and the area for detection of each band and their ratio was used to determine ethanol and methanol concentration. Detection was down to 0.0004 mg/ml methanol in the presence of high alcohol concentrations. The Sodium Nitroprusside colorimetric method (pdf) looks promising. The paper reports it is linear in the range 0.02-6.0 mg/ml. This covers the normal range for wine and can detect dangerous levels, but typical beer/cider values may not be detectable. Ethanol at 2 mg/ml changed the absorbance by 5%–typical alcohol levels are 20-150 mg/ml. Using a standard with the expected alcohol concentration 5%, 7.5%, 15% can control for this to an extent, but as the ethanol value is also an unknown, will likely increase error and reduce the detection limit. Testing would be needed to assess. The detection is spectrographic (absorbance at 481 nm). /25g) and potassium ferricyanide ($11/100g). Note that sodium nitroprusside is a vasodialator–breaks down in circulation to release nitric oxide (NO).